Lobster boats are moored in the harbor in Stonington, Maine, July 4, 2017. This is part of "Ocean Shock," a Reuters series exploring climate change's impact on sea creatures and the people who depend on them. To stand at the edge of an ocean is to face an eternity of waves and water, a shroud covering seven-tenths of the Earth. Hidden below are mountain ranges and canyons that rival anything on land. There you will find the Earth's largest habitat, home to billions of plants and animals -- the vast majority of the living things on the planet. In this little-seen world, swirling super-highway currents move warm water thousands of miles north and south from the tropics to cooler latitudes, while cold water pumps from the poles to warmer climes. 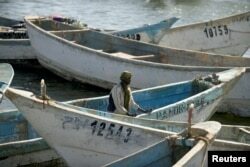 Artisanal fishing boats moored in the harbor at Nouadhibou, the main port in Mauritania, April 14, 2018. It is a system that we take for granted as much as we do the circulation of our own blood. It substantially regulates the Earth's temperature, and it has been mitigating the recent spike in atmospheric temperatures, soaking up much of human-generated heat and carbon dioxide. Without these ocean gyres to moderate temperatures, the Earth would be uninhabitable. In the last few decades, however, the oceans have undergone unprecedented warming. Currents have shifted. These changes are for the most part invisible from land, but this hidden climate change has had a disturbing impact on marine life -- in effect, creating an epic underwater refugee crisis. Reuters has discovered that from the waters off the East Coast of the United States to the coasts of West Africa, marine creatures are fleeing for their lives, and the communities that depend on them are facing disruption as a result. As waters warm, fish and other sea life are migrating poleward, seeking to maintain the even temperatures they need to thrive and breed. The number of creatures involved in this massive diaspora may well dwarf any climate impacts yet seen on land. In the U.S. North Atlantic, for example, fisheries data show that in recent years, at least 85 percent of the nearly 70 federally tracked species have shifted north or deeper, or both, when compared to the norm over the past half-century. And the most dramatic of species shifts have occurred in the last 10 or 15 years. A fisherman unloads sardines at the port in Matosinhos, Portugal, May 28, 2018. Fish have always followed changing conditions, sometimes with devastating effects for people, as the starvation that beset Norwegian fishing villages in past centuries when the herring failed to appear one season will attest. But what is happening today is different: The accelerating rise in sea temperatures, which scientists primarily attribute to the burning of fossil fuels, is causing a lasting shift in fisheries. The changes below the surface are not an academic matter. Globally, fishing is a $140 billion to $150 billion business annually, according to the United Nations' Food and Agriculture Organization, and in some parts of the world, seafood accounts for half of the average person's diet. But the effects of this mass migration in the world's oceans are also much more intimate than that. Lindsay Copeland Frazier holds lobsters caught on her father's boat in Stonington, Maine, July 5, 2017. 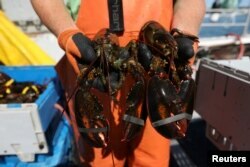 From lobstermen in Maine to fishermen in North Carolina, livelihoods are at stake. 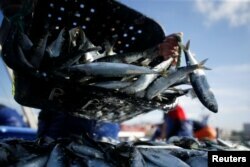 For sardine-eating Portuguese and seafood-loving Japanese, cultural heritages are at risk. And a burgeoning aquaculture industry, fueled in part by the effects of climate change, is decimating traditional fishing in West Africa and destroying coastal mangrove swamps in Southeast Asia. Reuters journalists have spent more than a year collecting their stories and little-reported data to bring you this series revealing the natural disaster unfolding beneath the whitecaps. VOA will be featuring stories from the Ocean Shock series over the next few weeks .